11 A None No Power Seat 11 A is a Business Class Bulkhead seat. Proximity to the galley and crew jumps seat may be bothersome. Passengers traveling with infants are often seated at this bulkhead. 11 B None No Power Seat 11 B is a Business Class Bulkhead seat. Proximity to the galley and crew jumps seat may be bothersome. Passengers traveling with infants are often seated at this bulkhead. 11 E None No Power Seat 11 E is a Business Class Bulkhead seat. While some find space slightly restricted, others enjoy that there is no one in front of you. Proximity to the galley and crew jumps seat may be bothersome. 11 F None No Power Seat 11 F is a Business Class Bulkhead seat. While some find space slightly restricted, others enjoy that there is no one in front of you. Proximity to the galley and crew jumps seat may be bothersome. 11 J None No Power Seat 11 J is a Business Class Bulkhead seat. Proximity to the galley and crew jumps seat may be bothersome. Passengers traveling with infants are often seated at this bulkhead. 11 K None No Power Seat 11 K is a Business Class Bulkhead seat. Proximity to the galley and crew jumps seat may be bothersome. Passengers traveling with infants are often seated at this bulkhead. 17 A None No Power Seat 17 A is a Business Class seat. Proximity to the lavatory and galley may be bothersome. 17 B None No Power Seat 17 B is a Business Class seat. Proximity to the lavatory and galley may be bothersome. 17 E None No Power Seat 17 E is a Business Class seat. Proximity to the lavatory and galley may be bothersome. 17 F None No Power Seat 17 F is a Business Class seat. Proximity to the lavatory and galley may be bothersome. 17 J None No Power Seat 17 J is a Business Class seat. Proximity to the lavatory and galley may be bothersome. 17 K None No Power Seat 17 K is a Business Class seat. Proximity to the lavatory and galley may be bothersome. 31 A None No Power Seat 31 A is an Economy Class Bulkhead seat. While some find space slightly restricted, others enjoy that there is no one in front of you. The tray table is in the armrest, making the armrest immovable and slightly reducing seat width. There is no floor storage during take-off and landing. Passengers traveling with infants are often seated at this bulkhead. 31 B None No Power Seat 31 B is an Economy Class Bulkhead seat. While some find space slightly restricted, others enjoy that there is no one in front of you. The tray table is in the armrest, making the armrest immovable and slightly reducing seat width. There is no floor storage during take-off and landing. Passengers traveling with infants are often seated at this bulkhead. 31 D None No Power Seat 31 D is an Economy Class Bulkhead seat. While some find space slightly restricted, others enjoy that there is no one in front of you. The tray table is in the armrest, making the armrest immovable and slightly reducing seat width. There is no floor storage during take-off and landing. Passengers traveling with infants are often seated at this bulkhead. 31 E None No Power Seat 31 E is an Economy Class Bulkhead seat. While some find space slightly restricted, others enjoy that there is no one in front of you. The tray table is in the armrest, making the armrest immovable and slightly reducing seat width. There is no floor storage during take-off and landing. Passengers traveling with infants are often seated at this bulkhead. 31 F None No Power Seat 31 F is an Economy Class Bulkhead seat. While some find space slightly restricted, others enjoy that there is no one in front of you. The tray table is in the armrest, making the armrest immovable and slightly reducing seat width. There is no floor storage during take-off and landing. Passengers traveling with infants are often seated at this bulkhead. 31 G None No Power Seat 31 G is an Economy Class Bulkhead seat. While some find space slightly restricted, others enjoy that there is no one in front of you. The tray table is in the armrest, making the armrest immovable and slightly reducing seat width. There is no floor storage during take-off and landing. Passengers traveling with infants are often seated at this bulkhead. 31 J None No Power Seat 31 J is an Economy Class Bulkhead seat. While some find space slightly restricted, others enjoy that there is no one in front of you. The tray table is in the armrest, making the armrest immovable and slightly reducing seat width. There is no floor storage during take-off and landing. Passengers traveling with infants are often seated at this bulkhead. 31 K None No Power Seat 31 K is an Economy Class Bulkhead seat. While some find space slightly restricted, others enjoy that there is no one in front of you. The tray table is in the armrest, making the armrest immovable and slightly reducing seat width. There is no floor storage during take-off and landing. Passengers traveling with infants are often seated at this bulkhead. 47 A None No Power Seat 47 A may have limited recline due to the wall behind. Close proximity to the lavatory may be bothersome as passengers tend to congregate in this area. 47 B None No Power Seat 47 B may have limited recline due to the wall behind. Close proximity to the lavatory may be bothersome as passengers tend to congregate in this area. 47 D None No Power Seat 47 D may have limited recline due to the wall behind. Close proximity to the lavatory may be bothersome as passengers tend to congregate in this area. 47 E None No Power Seat 47 E may have limited recline due to the wall behind. Close proximity to the lavatory may be bothersome as passengers tend to congregate in this area. 47 F None No Power Seat 47 F may have limited recline due to the wall behind. Close proximity to the lavatory may be bothersome as passengers tend to congregate in this area. 47 G None No Power Seat 47 G may have limited recline due to the wall behind. Close proximity to the lavatory may be bothersome as passengers tend to congregate in this area. 47 J None No Power Seat 47 J may have limited recline due to the wall behind. Close proximity to the lavatory may be bothersome as passengers tend to congregate in this area. 47 K None No Power Seat 47 K may have limited recline due to the wall behind. Close proximity to the lavatory may be bothersome as passengers tend to congregate in this area. 48 A None No Power Seat 48 A is an Economy Class Exit Row seat which has extra space, though some of your legroom is impeded by the slide that protrudes from the exit door and you may have to angle your legs to fully stretch them. Proximity to the lavatories may be bothersome as passengers tend to congregate in this area. The flight attendant seats are directly across from this row and you'll have to share your foot space during take-off and landing. The tray table is in the armrest, making the armrest immovable and slightly reducing seat width. There is no floor storage for this seat during take-off and landing. 48 B None No Power Seat 48 B is an Economy Class Exit Row seat with extra legroom. Proximity to the lavatories may be bothersome as passengers tend to congregate in this area. The flight attendant seats are directly across from this row and you'll have to share your foot space during take-off and landing. The tray table is in the armrest, making the armrest immovable and slightly reducing seat width. There is no floor storage for this seat during take-off and landing. 48 D None No Power Seat 48 D is an Economy Class Bulkhead seat. Proximity to the lavatories may be bothersome as passengers tend to congregate in this area. Passengers with infants are often seated at this bulkhead. The tray table is in the armrest, making the armrest immovable and slightly reducing seat width. There is no floor storage for this seat during take-off and landing. 48 E None No Power Seat 48 E is an Economy Class Bulkhead seat. Proximity to the lavatories may be bothersome as passengers tend to congregate in this area. Passengers with infants are often seated at this bulkhead. The tray table is in the armrest, making the armrest immovable and slightly reducing seat width. There is no floor storage for this seat during take-off and landing. 48 F None No Power Seat 48 F is an Economy Class Bulkhead seat. Proximity to the lavatories may be bothersome as passengers tend to congregate in this area. Passengers with infants are often seated at this bulkhead. The tray table is in the armrest, making the armrest immovable and slightly reducing seat width. There is no floor storage for this seat during take-off and landing. 48 G None No Power Seat 48 G is an Economy Class Bulkhead seat. Proximity to the lavatories may be bothersome as passengers tend to congregate in this area. Passengers with infants are often seated at this bulkhead. The tray table is in the armrest, making the armrest immovable and slightly reducing seat width. There is no floor storage for this seat during take-off and landing. 48 J None No Power Seat 48 J is an Economy Class Exit Row seat with extra legroom. Proximity to the lavatories may be bothersome as passengers tend to congregate in this area. The flight attendant seats are directly across from this row and you'll have to share your foot space during take-off and landing. The tray table is in the armrest, making the armrest immovable and slightly reducing seat width. There is no floor storage for this seat during take-off and landing. 48 K None No Power Seat 48 K is an Economy Class Exit Row seat which has extra space, though some of your legroom is impeded by the slide that protrudes from the exit door and you may have to angle your legs to fully stretch them. Proximity to the lavatories may be bothersome as passengers tend to congregate in this area. The flight attendant seats are directly across from this row and you'll have to share your foot space during take-off and landing. The tray table is in the armrest, making the armrest immovable and slightly reducing seat width. There is no floor storage for this seat during take-off and landing. 57 A None No Power Seat 57 A is an Economy Class seat with one-inch less legroom than other Economy Class seats on this plane. This seat can feel cramped due to the curvature of the plane. 57 B None No Power Seat 57 B is an Economy Class seat with one-inch less legroom than other Economy Class seats on this plane. This seat can feel cramped due to the curvature of the plane. 57 J None No Power Seat 57 J is an Economy Class seat with one-inch less legroom than other Economy Class seats on this plane. This seat can feel cramped due to the curvature of the plane. 57 K None No Power Seat 57 K is an Economy Class seat with one-inch less legroom than other Economy Class seats on this plane. This seat can feel cramped due to the curvature of the plane. 58 A None No Power Seat 58 A is an Economy Class seat with one-inch less legroom than other Economy Class seats on this plane. This seat can feel cramped due to the curvature of the plane. 58 B None No Power Seat 58 B is an Economy Class seat with one-inch less legroom than other Economy Class seats on this plane. This seat can feel cramped due to the curvature of the plane. 58 J None No Power Seat 58 J is an Economy Class seat with one-inch less legroom than other Economy Class seats on this plane. This seat can feel cramped due to the curvature of the plane. 58 K None No Power Seat 58 K is an Economy Class seat with one-inch less legroom than other Economy Class seats on this plane. This seat can feel cramped due to the curvature of the plane. 59 A None No Power Seat 59 A is an Economy Class seat with one-inch less legroom than other Economy Class seats on this plane. This seat can feel cramped due to the curvature of the plane. 59 B None No Power Seat 59 B is an Economy Class seat with one-inch less legroom than other Economy Class seats on this plane. This seat can feel cramped due to the curvature of the plane. 59 D None No Power Seat 59 D is an Economy Class seat that juts into the aisle and is often bumped by service carts and other passengers during flight. 59 G None No Power Seat 59 G is an Economy Class seat that juts into the aisle and is often bumped by service carts and other passengers during flight. 59 J None No Power Seat 59 J is an Economy Class seat with one-inch less legroom than other Economy Class seats on this plane. This seat can feel cramped due to the curvature of the plane. 59 K None No Power Seat 59 K is an Economy Class seat with one-inch less legroom than other Economy Class seats on this plane. This seat can feel cramped due to the curvature of the plane. 60 A None No Power Seat 60 A is an Economy Class seat with one-inch less legroom than other Economy Class seats on this plane. This seat can feel cramped due to the curvature of the plane. 60 B None No Power Seat 60 B is an Economy Class seat with one-inch less legroom than other Economy Class seats on this plane. This seat can feel cramped due to the curvature of the plane. 60 D None No Power Seat 60 D is an Economy Class seat that has restricted legroom because of the transition from 4 seats across to 3 seats across. While you have some extra storage space, you'll have to maneuver your legs around the extra seat anchors. 60 E None No Power Seat 60 E is an Economy Class seat that has restricted legroom because of the transition from 4 seats across to 3 seats across. While you have some extra storage space, you'll have to maneuver your legs around the extra seat anchors. 60 F None No Power Seat 60 F is an Economy Class seat that has restricted legroom because of the transition from 4 seats across to 3 seats across. While you have some extra storage space, you'll have to maneuver your legs around the extra seat anchors. 60 J None No Power Seat 60 J is an Economy Class seat with one-inch less legroom than other Economy Class seats on this plane. This seat can feel cramped due to the curvature of the plane. 60 K None No Power Seat 60 K is an Economy Class seat with one-inch less legroom than other Economy Class seats on this plane. This seat can feel cramped due to the curvature of the plane. 61 A None No Power Seat 61 A is an Economy Class seat with one-inch less legroom than other Economy Class seats on this plane. This seat can feel cramped due to the curvature of the plane. 61 B None No Power Seat 61 B is an Economy Class seat with one-inch less legroom than other Economy Class seats on this plane. This seat can feel cramped due to the curvature of the plane. 61 J None No Power Seat 61 J is an Economy Class seat with one-inch less legroom than other Economy Class seats on this plane. This seat can feel cramped due to the curvature of the plane. 61 K None No Power Seat 61 K is an Economy Class seat with one-inch less legroom than other Economy Class seats on this plane. This seat can feel cramped due to the curvature of the plane. 62 A None No Power Seat 62 A is an Economy Class seat with one-inch less legroom than other Economy Class seats on this plane. This seat can feel cramped due to the curvature of the plane. 62 B None No Power Seat 62 B is an Economy Class seat with one-inch less legroom than other Economy Class seats on this plane. This seat can feel cramped due to the curvature of the plane. 62 J None No Power Seat 62 J is an Economy Class seat with one-inch less legroom than other Economy Class seats on this plane. This seat can feel cramped due to the curvature of the plane. 62 K None No Power Seat 62 K is an Economy Class seat with one-inch less legroom than other Economy Class seats on this plane. This seat can feel cramped due to the curvature of the plane. 63 A None No Power Seat 63 A is located in the last row of the aircraft and may have limited recline. Proximity to the lavatory may be bothersome as passengers tend to congregate in this area. 63 B None No Power Seat 63 B is located in the last row of the aircraft and may have limited recline. Proximity to the lavatory may be bothersome as passengers tend to congregate in this area. 63 D None No Power Seat 63 D is an Economy Class seat, although proximity to the lavatory may be bothersome as passengers tend to congregate in this area. 63 F None No Power Seat 63 F is an Economy Class seat, although proximity to the lavatory may be bothersome as passengers tend to congregate in this area. 63 J None No Power Seat 63 J is located in the last row of the aircraft and may have limited recline. Proximity to the lavatory may be bothersome as passengers tend to congregate in this area. 63 K None No Power Seat 63 K is located in the last row of the aircraft and may have limited recline. Proximity to the lavatory may be bothersome as passengers tend to congregate in this area. 64 D None No Power Seat 64 D is located in the last row of the aircraft and may have limited recline. Proximity to the lavatory may be bothersome as passengers tend to congregate in this area. 64 E None No Power Seat 64 E is located in the last row of the aircraft and may have limited recline. Proximity to the lavatory may be bothersome as passengers tend to congregate in this area. 64 F None No Power Seat 64 F is located in the last row of the aircraft and may have limited recline. Proximity to the lavatory may be bothersome as passengers tend to congregate in this area. 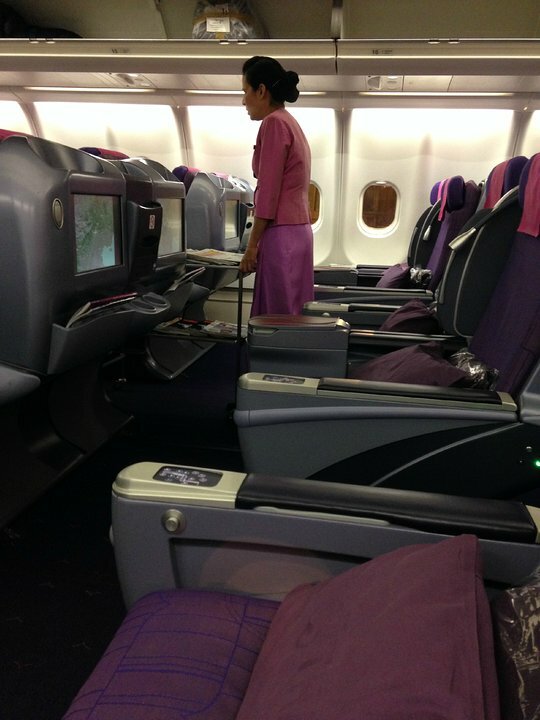 Thai Airways offers audio selections in all classes of service with 110 music albums and 31 games. All seats are equipped with Thai's personal AVOD entertainment system. Royal Silk Business Class seats have a 15-inch seat-back LCD screen, orm 10.4" screen if located in an armrest. Economy Class seats have a 9-inch seat-back screen or a 6.5" screen if located in the armrest. 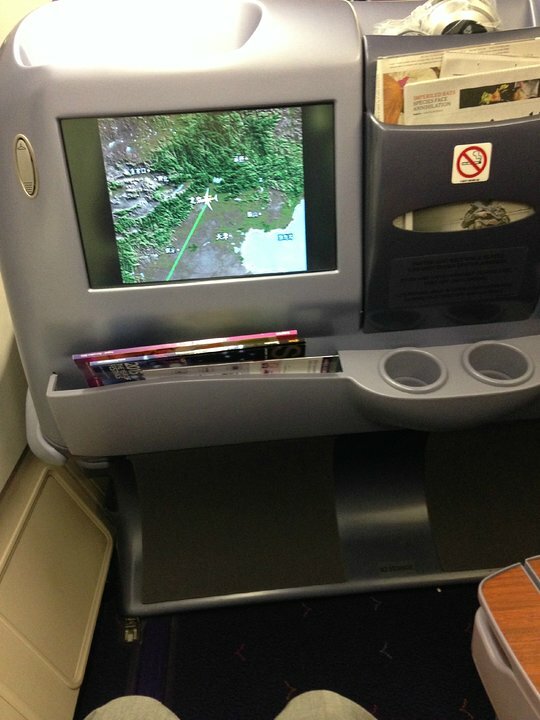 Monitors will be located in the armrest generally if they are at a Bulkhead seat. AVOD offers entertainment options of up to 30 movies or TV programs. All seats in both classes have a 110 volt AC power port (VAC) which does not require an adapter. Thai Airways has two versions of their A330-300 aircraft. 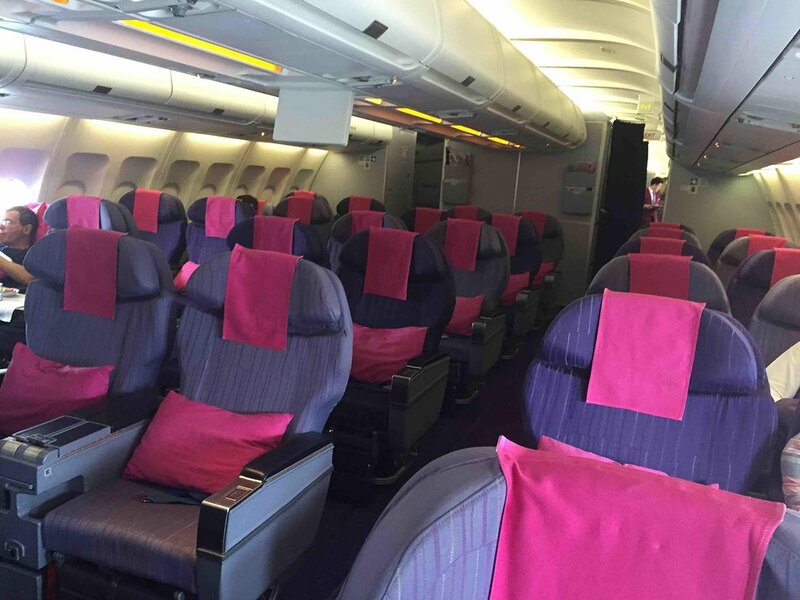 This version features 36 capsule style seats in Royal Silk Business Class and 263 standard Economy Class seats. Royal Silk Class seats offer lumbar support and massage functionality and a footrest. For reference, the following seat numbers can be used: Royal Silk Business Class is offered from row 11 to 17. Economy Class is offered from row 31 to 64. In Economy Class, all A, E, F, and K seats have limited underseat leg and storage room due to the presence of an entertainment equipment box. Beware, overhead compartment for Row 31 & 32 are normally stuffed with in-flight blankets, or worst case scenario, the overhead bins are marked with 'Crew Only' . ticket paying passengers are 'ignored' completely, passengers seating on both row 32 & 32 must find empty bin spaces further down the aisle. A chaotic moment while landed. Why crews bags are occupying passenger's facility & space ? TG operates a new version (to my knowledge only one plane to this date) of the A330-300. I took to from BKK to PER. 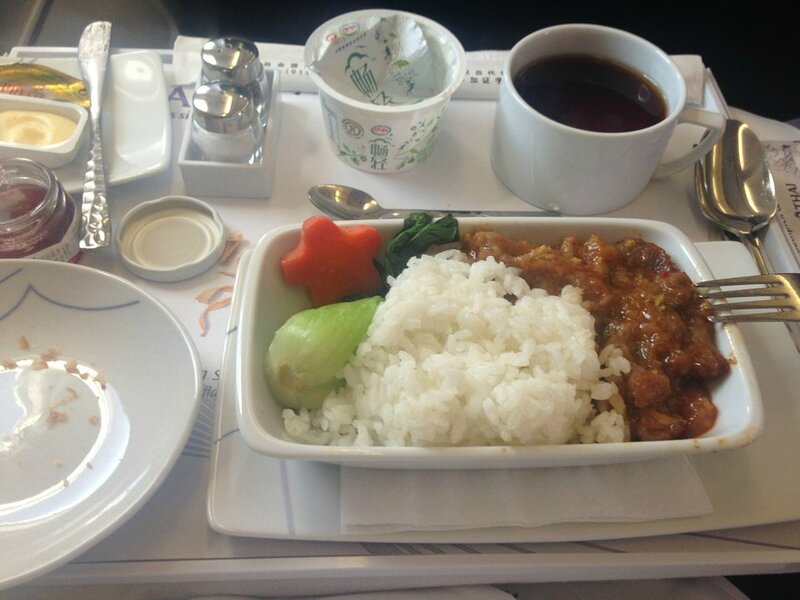 It comes with a seating much alike the dated Swiss and Finnair Business Class on their A340s. Left side is one seat only. Middle is two seats, Right side is one seat and two seat rows alternating. 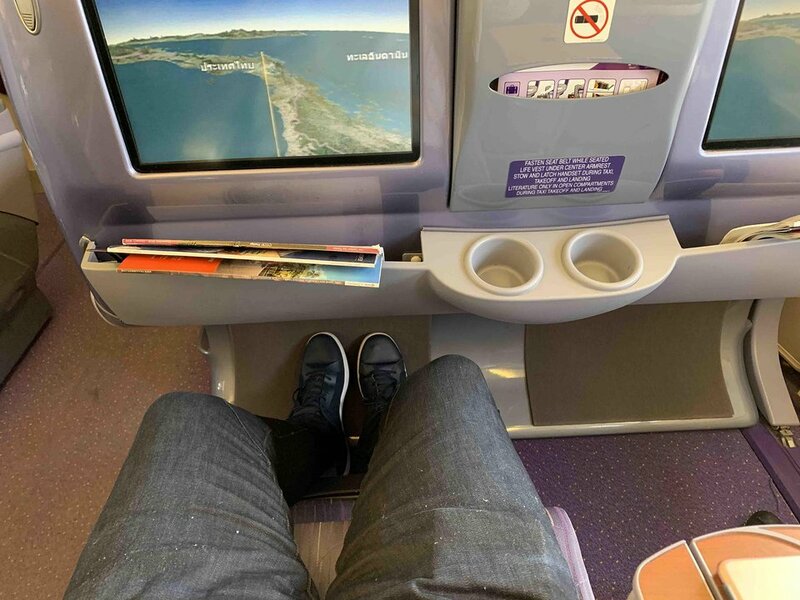 There is a box in 34k that affects the legroom in 35k; you can't extend both of your legs in 35k. In Addition: Row 17 (All seats) in the Royal Silk Class has limited or no overhead bin stowage. It is reserved for Cabin Crew and flight amenities such as newspapers. There is no stowage for baggage under the seats in front either so it is not a good seat if you have any carry on. Limited foot-space due to IFE box. If above 180cm avoid this seat. Limited foot space due to IFE box. If above 180cm avoid this seat. Overhead storage on these 3 rows, are marked with 'CREW ONLY'. Passengers assigned on these rows will find the overhead storage already 'FULL' on boarding, mostly with Crew's luggage or packed blankets. Passengers has to struggle to find storage on top of row 34 and further. I think the arrangement was ill-considerate, and unfair to paid passengers. Imagine how panicky the situation on arrival. The seat feels old and dated as does the entire aircraft. It is a shame that they use the old style business class seats on the regional flights. No noise cancelling headphones, The IFE felt old and limited. Food service was ok. Compared to Qatar or Lufthansa, Thai has a long way to go. I switched from 56K so I could get my own pair of seats, and didn't notice any disparity in legroom. Love the footrests, and like how they added them even in their newest aircraft. I like it. Many people hate back side of flight. so there are no people. there are some empty seat. And Crew had not made noisy from my 4 times flight. I don't agree that last seats are noisy. THAI flies 1 versions of Airbus A330-300.